If your business has a sales team, inside or out, you understand the difficult and painful process of setting appointments. It’s becoming harder to accomplish, even for the best salespeople. 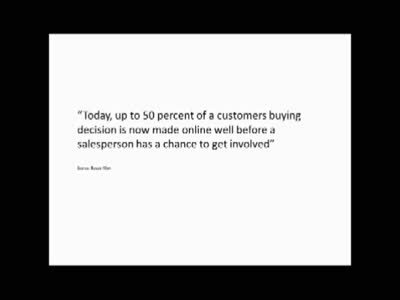 What has changed in sales and what can your salespeople do to change with it? One of the biggest changes over the past few decades is that clients have become incredibly busy and inundated with information. Many people simply don’t have time to talk on the phone or meet with a salesperson. When they want to buy something, customers will look into it themselves. The challenge for salespeople is to engage customers in a way that shows that the salesperson is actually doing the customer a favor, not wasting their time. Just like there is more than one way to eat a chocolate, peanut-buttery treat, there are multiple strategies to reach clients. They key is to use all of these strategies in a way that best reaches your clients. In this way, a woman who is more responsive to a networking event and a man who trusts LinkedIn connections are both clients your business can gain because you do both. We’ll start small. One simple thing your sales team can do is start leaving voicemails. Many companies question whether voicemails harm or better your chances of success, but let’s go beyond questioning and look at the numbers. Most businesses have a return call rate of 5-10% from their voicemail messages. Imagine if a salesperson leaves 100 voicemails in a week, which is about 5,200 voicemails in a year. 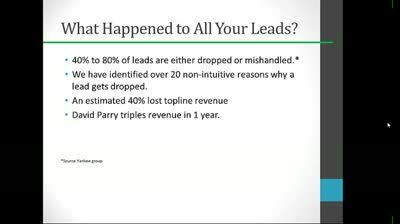 If that salesperson receives only a 5% call back rate, that’s over 260 returned calls a year. That’s a huge amount of potential business stirred up just from voicemails, and most salespeople leave well over 100 voicemails a week. So how can you leave the most affective voicemail? It must be professional, and it must be polite, but the key to success is incorporating a value statement into the message. This message is not about you or your company being the best. 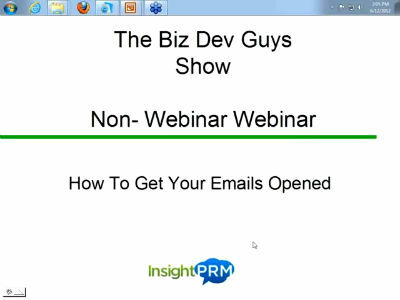 You need to communicate in these voicemails what is in it for the customer and tailor them to capture their attention. The value statement used to describe InsightPRM is a good example—“We identify $10 Billion in purchases before prospective clients select a vendor.” That’s a statement that raises eyebrows and leaves the customer asking for more. Raise more questions than you answer to really engage the customer’s interest with your value statement. A second easy way to get in touch with clients is utilizing social media to the utmost, especially sites like LinkedIn. 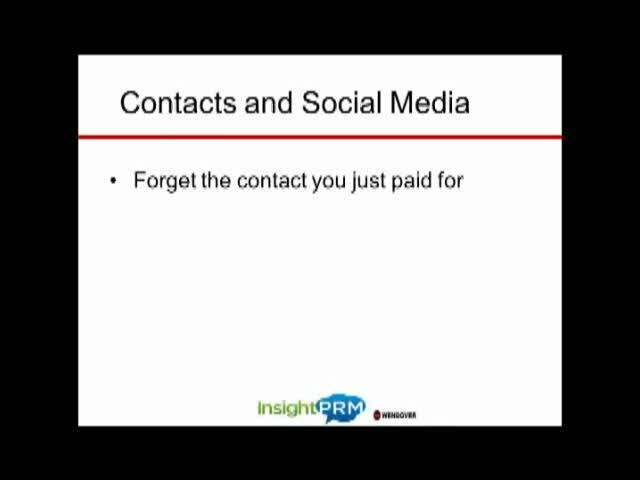 Although businesses spend a lot of money buying leads to gain key contacts, utilizing social media to research those contacts and perhaps find an even better contact is crucial. For example, if you buy leads from InsightPRM, you could gain the name of a company and a contact to reach out to. You could stop there, make the call, and see where the die lands. Or, you could look up that business on LinkedIn and see if you have any connections with the people working there. Maybe an associate has a relative or neighbor that works in upper management. You can actually leverage this connection by contacting that associate and asking what they know about this upper management contact and whether a meeting would at all be possible. Your connection could then help you have a conversation not with a sales manager who may shut you down, but an upper level person who has much more influence over the decision making of that business. In this way, LinkedIn is a huge boon to B2B sales. To really make LinkedIn work for you, though, you must have all of your staff LinkedIn, and you must “link in” with all previous clients. Without this large network, it is unlikely that you will locate as many key connections. The third easy strategy your business can adopt at a minimal cost is snail mail. Many believe mailing marketing material is dead, but research shows that appointment setting increased up to three times when calls were made immediately after marketing material was sent. Other research points out that appointment setting increased nine times when calls were made to nurtured leads—leads that have received snail mail, then a few days later an e-mail, then a few weeks later a brochure, etc. 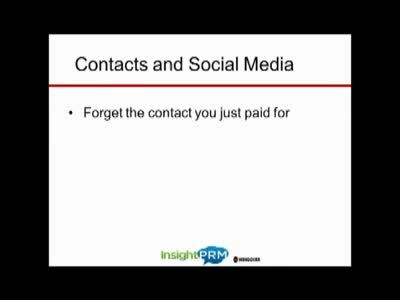 Continuing to send out material and contacting leads is crucial because there is no way for your sales team to know when the best time to contact a client is. One phone call may reach him at a bad time where a mail piece could arrive on his desk right at the time he is considering buying. Sending a post card or brochure is an easy thing to do, but it can make a huge impact on your sales. The final piece of the appointment-setting puzzle is engagement marketing. This has become a very popular strategy among businesses, and for good reason—it works. What engagement marketing does is it allows you to approach the customer in a different way. It could be anything from offering a webinar to setting up a networking event. It offers the prospective client something they need, and is a more engaging way to grab their interest than forcing a sale down their throats. Plus, inviting a person to a webinar or event is much easier than saying, “I want to sell you something.” Your sales team will receive a much more positive response from prospects and stir up a lot more appointments and deals.